As mentioned, we did bunker a lot of gammon after Christmas. Because of that, some creativity is needed in order to not get fed up by it. 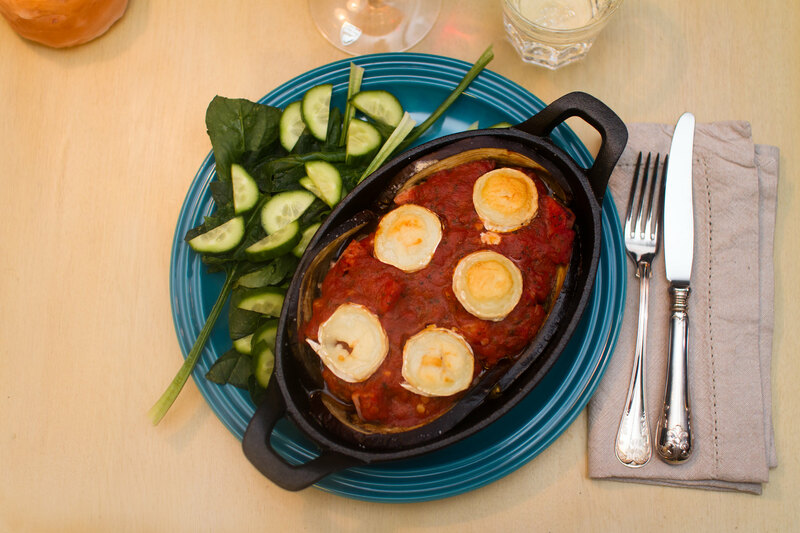 This innovative dish with eggplant and tomato sauce in a cast iron ramekin turned out really nice. Find the recipe below. 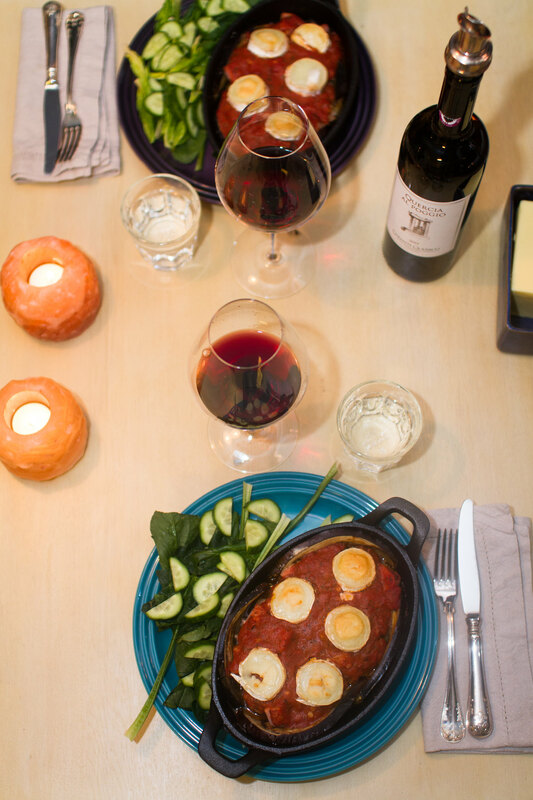 Dinner served in cast iron ramekins. In order to reduce any possible bitterness of the eggplant, slice them and sprinkle salt over. Let the salt drag out liquid for about 10 minutes and dry them with a paper towel. We don’t always do that and usually the eggplant is fine anyway, but this time I thought it was convenient to make the slices a bit softer as well so that they could be fitted into the ramekins. 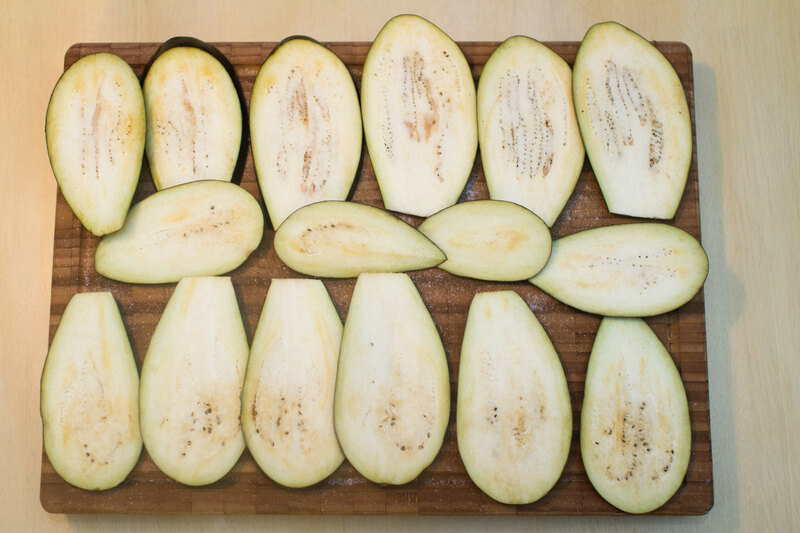 First, salt the eggplant slices. 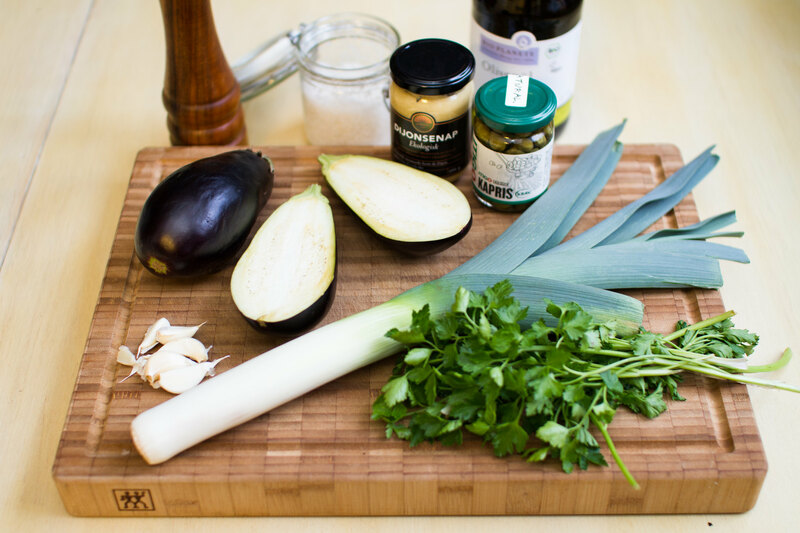 Ingredients used in the dish. 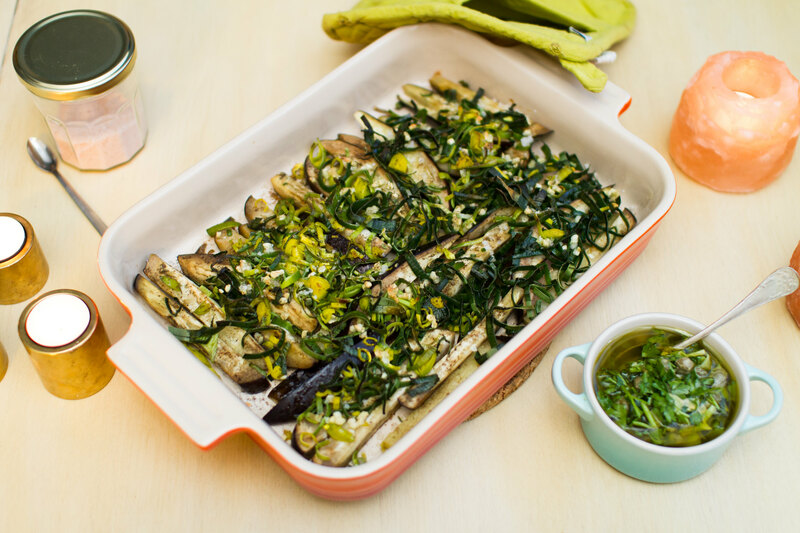 Place the sliced eggplant in suitable oven ramekin and bake in the oven at 225°C for about 15 minutes, until soft and slightly browned. Mix the canned tomatoes with dijon mustard, pressed garlic, basil, salt and pepper. Dice the ham in small cubes. Put the ham in the eggplant and cover with the tomato sauce. Top with some goat cheese. Finish off in the oven at 225°C for another 15 minutes until the goat cheese is golden. Eggplant and gammon in tomato sauce topped with goat cheese and some greens. 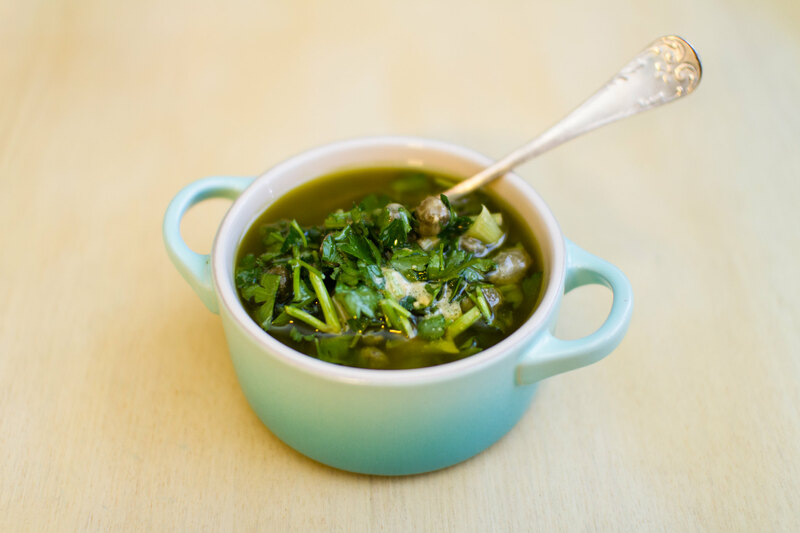 Serve with some greens and a nice glass of red wine if you like. 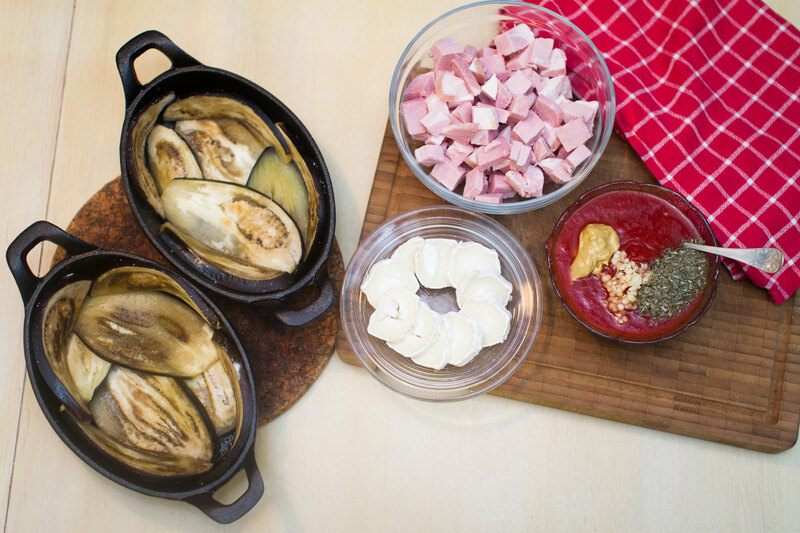 The cast iron ramekins not only keep the food warm throughout the dinner, they seems to add a lot of iron to the food as well based on the iron taste that the food gets. Very nice! Having some eggplant and butternut squash in the fridge, I just couldn’t resist to make something spicy with curry out of it! The eggplant, butternut and onions are first roasted in the oven with the spices and then blended with coconut cream and crushed tomatoes. That gives a maximum load of flavors. Vegetable curry with chicken legs for dinner. 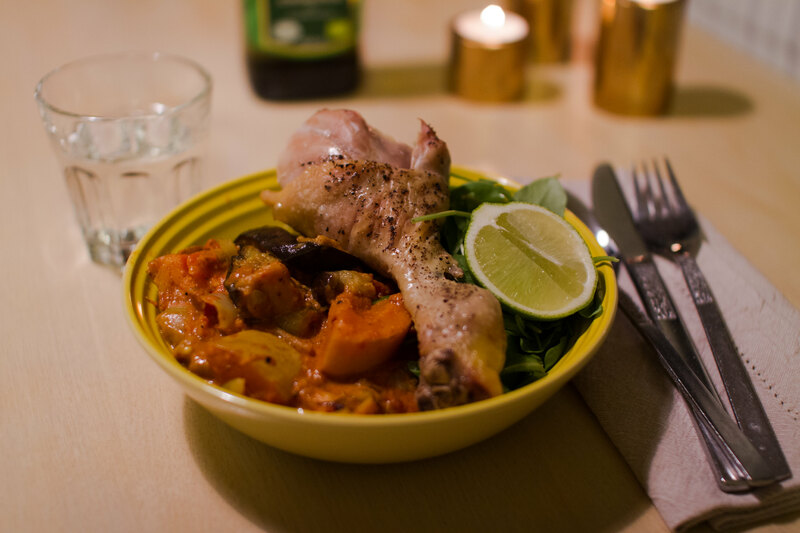 The veggie curry was served with chicken legs made in the oven, some greens and lime juice to add some really nice acidity. 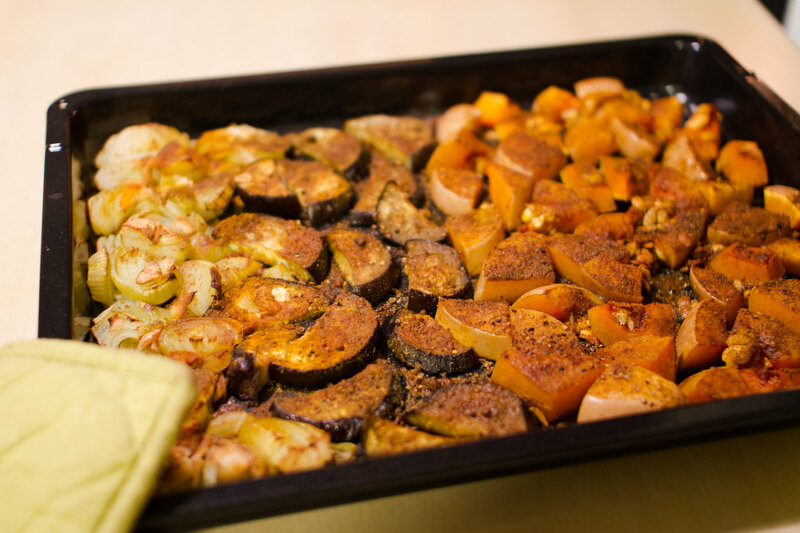 Oven roasted vegetables with spices. The vegetables coming out of the oven after being roasted for about 25 minutes at 225°C. You can see the generous amount of spices used! Make sure to use spices of good quality that really tastes something. Make also sure that they´re organic since spices are in concentrated form and therefore can contain a lot of pesticides and other toxins. 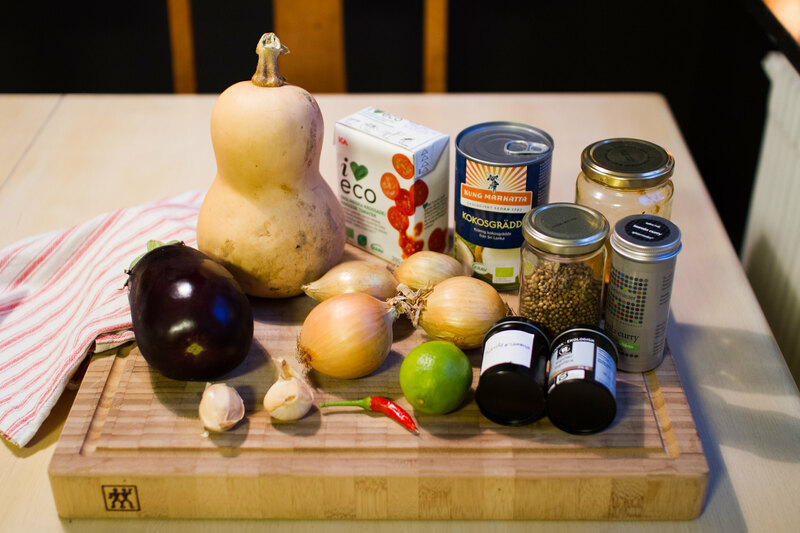 Ingredients used in the curry. 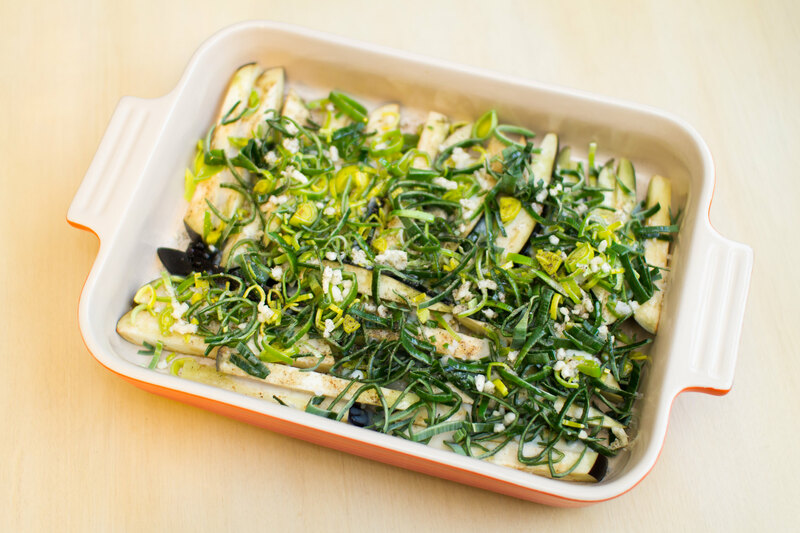 Chop the vegetables in rather large pieces and place at a baking plate. Grind the coriander and cardamom seeds in a mortar and add together with the rest of the seasoning, excluding the chili and lime, on top of the veggies. Cover with coconut oil and roast in the oven for about 25 minutes at 225°C. Warm the coconut cream and crushed tomatoes in a pot and add the chili. When the veggies are roasted, add them into the pot and let simmer for about 10 minutes to let the flavors set a bit more. 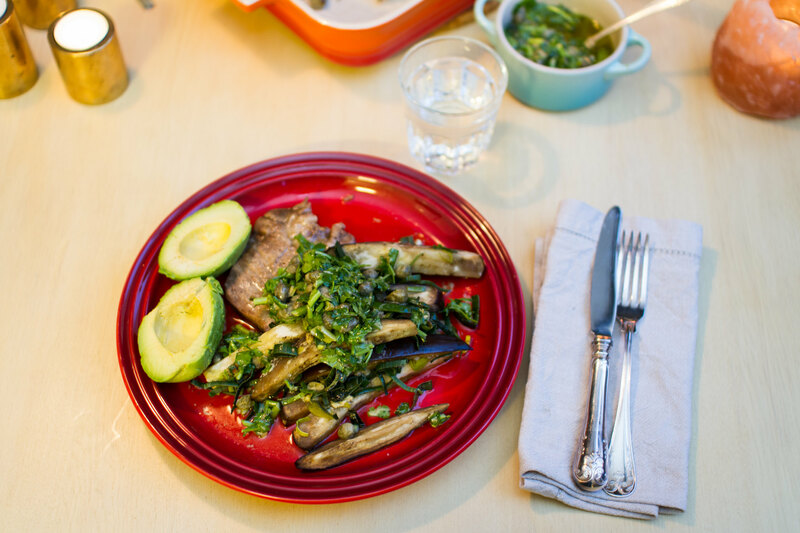 Serve with some lime juice on top! 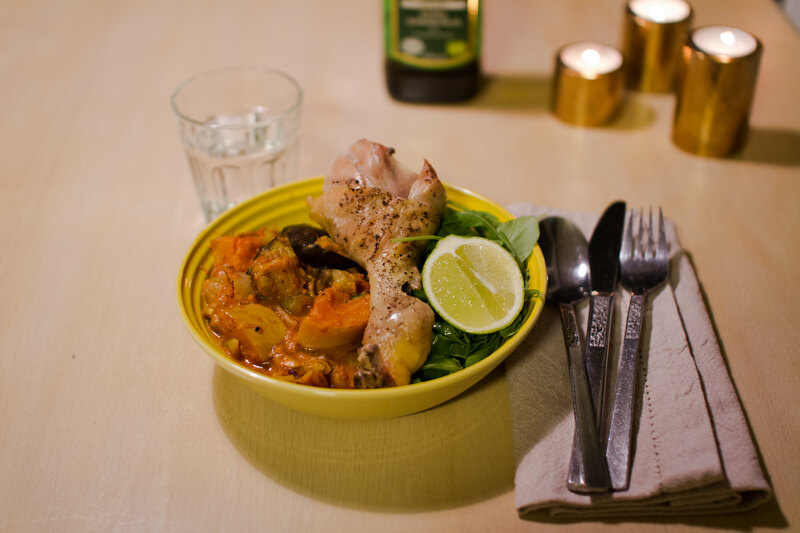 A fresh but warming dinner for a autumn evening!